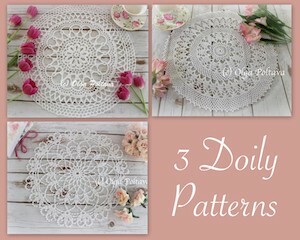 Here is another doily made from a vintage pattern. 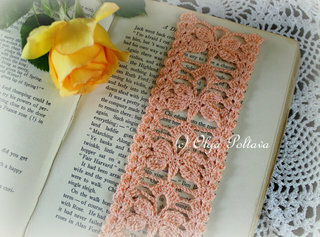 I used size ten crochet cotton thread and 1.25 mm steel hook. 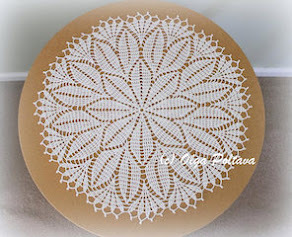 My doily came out 20 inches in diameter. I changed the colors after Round 12, Round 20, and Round 24. 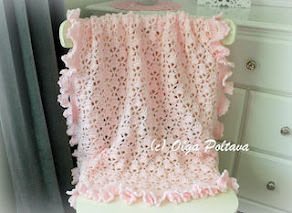 As I was crocheting this doily, it ruffled quite a bit. 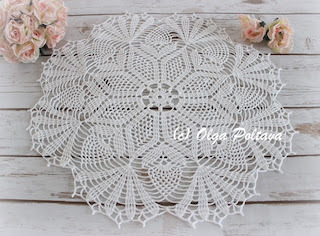 But once the doily was finished and blocked, it turned out perfectly flat and beautiful! 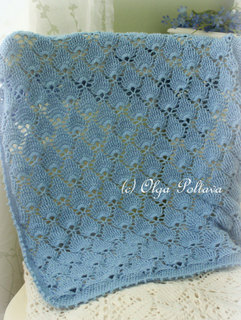 You can see my shortcut to blocking doilies post here. Rnd 1: Ch 10, join with sl st to form ring, ch 1, 16 sc in ring, join with sl st in first sc. Rnd 3: Ch 1, sc in joining, [ch 4, sc in next tr] 15 times, ch 2, hdc in first sc to form last lp. Rnd 4: Ch 1, sc in lp just formed, *ch 5, hold last lp of each tr on hook, 5 tr in next ch-4 lp, thread over and through all 6 lps on hook (5-tr-cl), ch 5, sc in next lp, rep from * around, end with ch 5, hold last lp of each tr and dtr on hook, 5 tr in next lp, dtr in first sc, thread over and through all 7 lps on hook. Rnd 5: Ch 1, *sc in tip of tr-cl, ch 11, rep from * around, join with sl st in first sc. Rnd 6: Ch 1, *sc in joining, *[sc, ch 5] 5 times in next lp, sc in same lp, sc in next sc, rep from * around, end with [sc, ch 5] 5 times in last lp, sc in same lp, join with sl st in first sc. Rnd 7: Sl st to center of next lp, sc in same lp, *[ch 5, sc in next lp] 4 times, ch 3, sc in next lp, rep from * around, end with ch 1, hdc in first sc to from last lp. Rnd 8: Ch 5, 4-dtr-cl in lp just formed, *ch 7, skip next ch-5 lp, sc in next ch-5 lp, ch 5, sc in next ch-5 lp, ch 7, skip next ch-5 lp, 5-dtr-cl in next ch-3 lp, rep from * around, end with ch 7, join with sl st in tip of first dtr-cl. Rnd 9: Ch 16, *dc in next ch-5 lp, ch 13, dc in tip of next dtr-cl, ch 13, rep from * around, join with sl st in 3rd ch of ch-16. Rnd 10: Ch 1, sc in joining, *[sc, ch 5] 5 times in next lp, sc in same lp, sc in next dc, rep from * around, join with sl st in first sc. Rnd 11: Rep Rnd 7. Rnd 12: Ch 5, 4-dtr-cl in lp just formed, *ch 6, skip next lp, sc in next lp, ch 5, sc in next lp, ch 6, skip next lp, 5-dtr-cl in next ch-3 lp, rep from * around, end with ch 6, join with sl st in tip of first dtr-cl. Rnd 13: Ch 12, *dc in next ch-5 lp, ch 9, dc in tip of next dtr-cl, ch 9, rep from * around, join with sl st in 3rd ch of ch-12. Rnds 15-19: Ch 1, sc in lp just formed, *ch 5, sc in next lp, rep from * around, end with ch 2, dc in first sc. Rnd 21: Sl st to tip of next tr-cl, ch 16, *dc in tip of next tr-cl, ch 13, rep from * around, join with sl st in 3rd ch of ch-16. Rnd 22: Rep Rnd 10. Rnd 23: Sl st to center of next lp, sc in same lp, *[ch 4, sc in next lp] 4 times, ch 3, sc in next lp, rep from * around, end with ch 1, hdc in frist sc to form last lp. Rnd 24: Rep Rnd 8. Rnd 25: Ch 1, *sc in tip of dtr-cl, ch 19, rep from * around, join with sl st in first sc. Rnd 26: Ch 1, sc in joining, *[ch 5, skip next 3 ch, sc in next ch] 4 times, ch 5, sc in next sc, rep from * around, end with ch 2, dc in first sc. Rnd 27: Ch 1, sc in lp just formed, *ch 3, sc in next lp, [ch 5, sc in next lp] 4 times, rep from * around, end with ch 2, dc in first sc. Rnd 28: Ch 1, sc in lp just formed, *3 dc in next ch-3 lp, sc in next ch-5 lp, ch 5, sc in next ch-5 lp, ch 7, sc in next ch-5 lp, ch 5, sc in next ch-5 lp, rep from * around, end with ch 2, dc in first sc. Rnd 29: Ch 1, 3 sc in lp just formed, *sl st in next [sc, 3 dc, and sc], 5 sc in next ch-5 lp, 7 sc in next ch-7 lp, 5 sc in next ch-5 lp, rep from * around, end with 2 sc in first lp used at beg of rnd, join with sl st in first sc. Rnd 30: Ch 3, [2-dc-cl, ch 3, 3-dc-cl] in base of ch-3, *ch 1, [3-dc-cl, ch 3, 3-dc-cl] in center sc of next lp, ch 1, [3-dc-cl, ch 5, 3-trc-cl, ch 5, 3-dc-cl] in center sc of next lp, ch 1, [3-dc-cl, ch 3, 3-dc-cl] in center sc of next lp, rep from * around, end with ch 1, join with sl st in tip of first dc-cl, fasten off. This is a vintage doily pattern from Star Book #66 by American Thread Company, 1949. 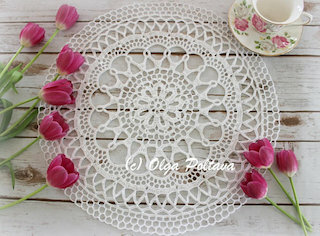 To make this doily I used size ten crochet cotton thread and 1.25 mm steel hook. 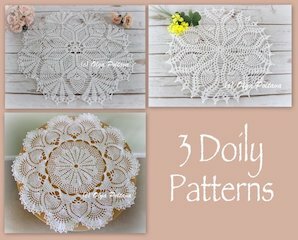 My doily came out about twelve inches in diameter. I changed the color after round 10, and for the last round. 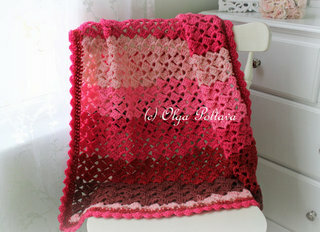 I'm posting this pattern exactly as it appears in the original publication. Ch 8, join to form a ring, ch 1 and work 16 sc in ring, join in 1st sc. 2nd Row – Ch 3, dc in next sc, *ch 2, 1 dc in each of next 2 sc, repeat from * 6 times, ch 2, join in 3rd st of ch. 3rd Row – Sl st to next loop, ch 3 (counts as 1/3 part of 1st cluster st), * thread over hook, insert in loop, pull through and work off 2 loops, repeat from * once, thread over and work off all loops at one time, ** ch 7, cluster st in next loop (cluster st: thread over hook, insert in loop, pull through and work off 2 loops, * thread over hook, insert in same loop, pull through and work off 2 loops, repeat from * once, thread over and work off all loops at one time), repeat from ** 6 times, ch 7, join in 1st cluster st.
4th Row – Ch 1, sc in same space, * 7 sc over next loop, sc in next cluster st, repeat from * 6 times, 7 sc over next loop, join in 1st sc. 5th Row – Ch 6, skip 1 sc, trc in next sc, *ch 2, skip 1 sc, trc in next sc, repeat from * all around, ch 2, join in 4th st of ch. 6th Row – Ch 7, trc in next trc, *ch 3, trc in next trc, repeat from * all around, ch 3, join. 7th Row – Ch 8, trc in next trc, *ch 4, trc in next trc, repeat from * all around, ch 4, join. 8th Row – Ch 9, trc in next trc, *ch 5, trc in next trc, repeat from * all around, ch 5, join. 9th Row – Ch 4, trc in same space, *ch 4, 2 trc in next trc, repeat from * all around, ch 4, join. 10th Row – Ch 4, trc in next trc, * ch 5, 1 trc in each of the next 2 trc, repeat from * all around, ch 5, join. 11th Row – Ch 1, sc in same space, sc in next trc, * 6 sc over next loop, 1 sc in each of the next 2 trc, repeat from * all around, ending with 6 sc over next loop, join in 1st sc (256 sc). 12th Row – Ch 3, dc in same space, ch 2, 2 dc in same space, *ch 2, skip 2 sc, 1 sc in each of the next 11 sc, ch 2, skip 2 sc, 2 dc, ch 2, 2 dc (shell) in next sc, repeat from * all around ending row with ch 2, skip 2 sc, 1 sc in each of the next 11 sc, ch 2, skip 2 sc, join in 3rd st of ch. 13th Row – Sl st to center of shell, ch 3, dc in same space, ch 2, 2 dc in same space, ch 2, 2 dc in same space, * ch 3, skip 1 sc, 1 sc in each of next 9 sc, ch 3, 2 dc, ch 2, 2 dc, ch 2, 2 dc in center of next shell, repeat from * all around, ending row with ch 3, skip 1 sc, 1 sc in each of the next 9 sc, ch 3 join. 14th Row – Sl st to center of shell, ch 3, dc in same space, ch 2, 2 dc in same space, *ch 2, 2 dc, ch 2, 2 dc in next loop, ch 3, skip 1 sc, 1 sc in each of the next 7 sc, ch 3, skip 1 loop, 2 dc, ch 2, 2 dc in next loop, repeat from * all around ending row with ch 2, 2 dc, ch 2, 2 dc in next loop, ch 3, skip 1 sc, 1 sc in each of the next 7 sc, ch 3, join. 15th Row – Sl st to center of shell, ch 3, dc in same space, ch 2, 2 dc in same space, *ch 2, shell in next ch 2, shell in next shell, ch 3, skip 1 sc, 1 sc in each of the next 5 sc, ch 3, skip 1 loop, shell in next shell, repeat from * all around, ending row to correspond. 16th Row – Sl st to center of shell, shell in same space, * ch 2, 2 dc, ch 2, 2 dc, ch 2, 2 dc in next shell, ch 2, shell in next shell, ch 3, skip 1 sc, 1 sc in each of the next 3 sc, ch 3, shell in next shell, repeat from * all around ending row to correspond. 17th Row – Sl s to center of shell, shell in same space, * ch 2, skip 1 loop, shell in next loop, ch 2, shell in next loop, ch 2, skip 1 loop, shell in next shell, shell in next shell, repeat from * all around ending row to correspond. 18th Row – Sl st to center of shell, sc in same space, *ch 3, 2 dc in next shell, ch 4, sl st in 3rd st from hook for picot, ch 1, 2 dc in same space, ch 3, sc in next loop, ch 3, 2 dc in center of next shell, ch 3, sc in center of next shell, ch 3, sc in center of next shell, repeat from * all around ending with row to correspond, join, break thread. Happy New Year! I hope you all had a wonderful Holiday Season! 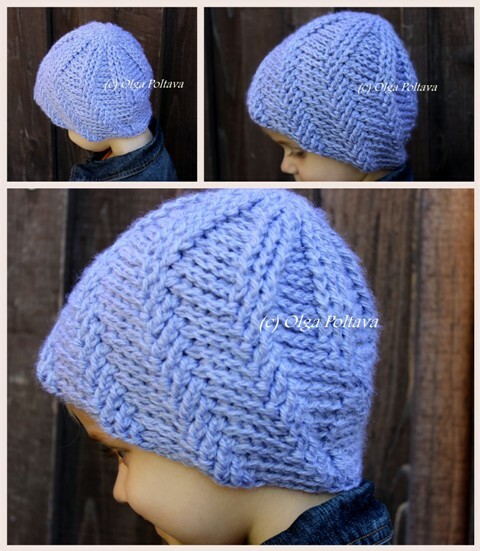 Originally, this pattern for a preschooler’s hat appeared in my Etsy and Craftsy shops. 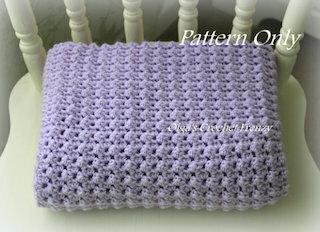 The pattern sat there for about half a year and was purchased only twice. 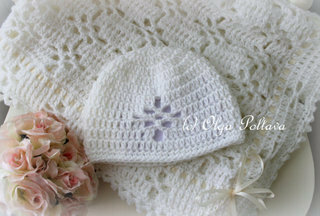 Hmm, I don’t know, I thought it was a cute hat pattern. Perhaps it’s the advanced skill level of this pattern that put my customers off. 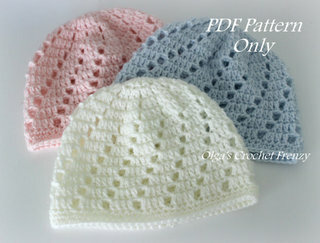 I noticed that the most popular patterns in my shops are the easiest ones. Anyway, I didn’t want all the work that I put into this pattern go to waste, so I’m sharing the pattern here. 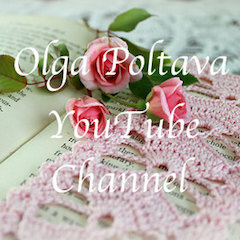 Please, do not copy and repost it on other websites, and do not sell it. 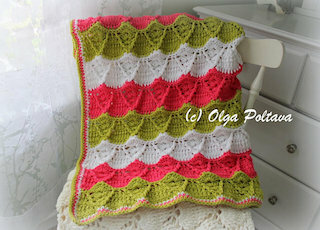 But you are welcome to sell the finished items made from this pattern. * * Instructions between asterisks should be repeated as many times as there are stitches to accommodate them. 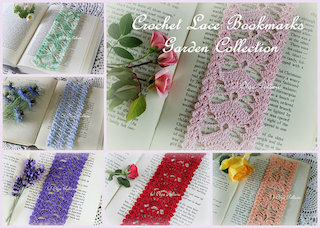 Pay special attention to Round 12 (and the following rounds), that’s where back post and front post double crochets begin to shift. Ch 4, join in ring with sl st. Round 21: same as Round 12. Round 22: same as Round 13. Round 23: same as Round 14.